Today is Dorothy Canfield Fisher's 137th birthday. 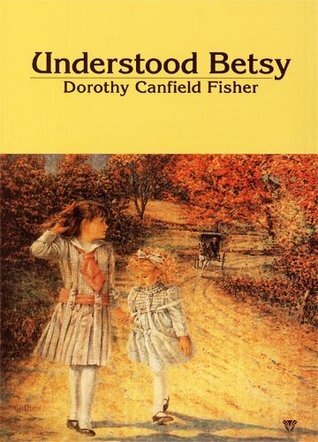 Her classic children's novel, Understood Betsy, which was first published in 1916, is also celebrating a birthday. It's 100th! How cool is that? Even better, Understood Betsy takes place in Vermont, which, for me, checks off another New England state in Lory's Reading New England Challenge. And that's three! When this novel begins, Elizabeth Ann is a thin, little girl of nine living with her Aunt Harriet and Aunt Francis who coddle and fuss over her. She is a fearful, dull child prone to tears. But then Aunt Harriet gets sick and Elizabeth Ann is sent to live with her Vermont relatives, Uncle Henry, Aunt Abigail, and Cousin Ann, at Putney Farm. They dub her Betsy and teach her to do things like drive a team of horses and make butter, as well as to act and think for herself. Betsy blossoms under the care of her Vermont relatives. She gets a kitten, gains some independence, makes new friends, has some adventures, and soon discovers that while "Not a thing had happened the way she had planned...it seemed to her she had never been so happy in her life." One hundred years after it was first written, Understood Betsy has a definite old-fashioned feel to it, with chapter headings like "Elizabeth Ann Fails in an Examination" and "Betsy Has a Birthday". Fisher is generous with her authorial comments throughout the novel, and Betsy learns many life lessons while at Putney Farm like, "A dim notion was growing in her mind that the fact that she had never done a thing was no proof that she couldn't." Wholesome would be a good word to describe this book, but I think that's why I like it. Understood Betsy transports you back to a more innocent time where life moves at a slower pace, hard work is valued, children don't grow up too fast, and happiness is found within the walls of a humble but loving home. It reminded me of both Pollyanna and Little Women, which isn't bad company to be in. So, Happy Birthday, Dorothy Canfield Fisher! I have never read this one, but I love that there were good children's books that taught important lessons. I loved Pollyanna, Little Women (and most of Alcott's books), the Anne books (especially Windy Poplars, when Anne is a teacher), and more from the early 20th c. Great review, Lark. Thank you! These "old-fashioned" children's books are some of my favorite reads. There's just something about them. I didn't know 2016 was the centenary of this book! I read it long ago, but I'm planning a reread for the challenge. Thanks for the lovely review. I love this book so much :) I downloaded a copy into Google Books, so I have it on my phone, and I often dip in for a minute, when I need a quiet moment. I love Betsy's birthday adventure at the fair! Thanks for the reminder about DCF's birthday, and about this book's as well! This book sounds delightful! I wish I'd run across it when I was about 12; it would still be on my bookshelf today. I think my sister even had a copy of this book when I was growing up, but I still never read it. Luckily, it's still in print, and I think I enjoyed it even more now than I would have then.